It's time once again for a giveaway! If your kids are like mine they are excited about this show! "In this original storyline, Mickey and Minnie lead the audience on an exciting adventure that will have families rooting for their favorite pirate Jake and Disney's first little girl princess Sofia. 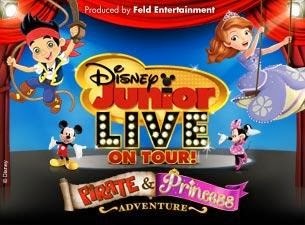 Disney Junior Live On Tour! Pirate & Princess Adventure begins with a special interactive pre-show featuring the loveable 6-year-old doctor to toys and stuffed animals, Doc McStuffins. Children and their parents will sing the “I Feel Better Song” along with Doc as she provides tender love and care. The excitement continues when families cast away to Never Land where Jake and his Yo Ho pirate friends Izzy and Cubby are in a race against time to locate a mysterious treasure-filled volcano. Danger, thrills and adventure lurk around every turn when our swashbuckling friends battle Captain Hook for the ultimate prize. Peter Pan makes a special appearance, aiding the team in their heroic quest, and with the help of Tinker Bell’s pixie dust, Jake and his crew fly above the stage in their journey." We are so excited to see Sophia!! Very excited about Sophia even though she thinks Jake is a cutie!! !